This past year is what the era of Big Climate Change looks like. We are only at the beginning of the massive changes we are making to our environment by farting 41 billion metric tons of carbon dioxide (a heat-trapping gas) into our atmosphere every year, but we can already see the shape of the future and it is alarming. (“Emissions” as a word is bland and means nothing to most people. Inform them that they are annually farting 18 tons of stuff into the atmosphere that you could light a match to, and maybe they will be a little embarrassed). Despite the urgency of the crisis we have done almost nothing to reduce carbon farting on a global scale. In fact it increased 2% last year. The oceans are hotter than they have ever been in nearly 140 years of recorded history. Tellingly, the study that nailed this finding is from the Chinese Academy of Sciences, not the Koch Brothers/ Mercer family US oligarchy, which is suffocating American science. (Hint: hot oceans produce more destructive hurricanes). Puerto Rico was flattened by two hurricanes in a row. One of them chugged along as an unprecedented category 6 for hundreds of miles, fed by a Caribbean that was a startling 2 degrees F. hotter than normal. St. Martin had 85% of its built environment razed by Hurricane Irma. 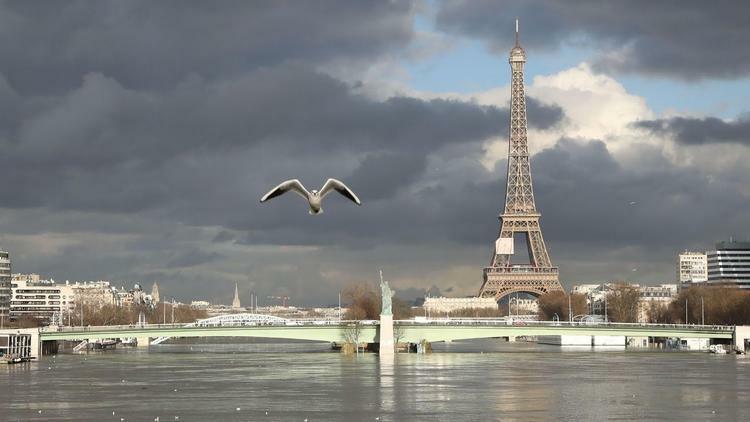 As we speak, the Seine is five times its normal level, flooding Paris and threatening the Louvre Museum. My alma mater, the University of California Los Angeles, almost burned down in December as wildfires invaded the city of the angels. Boston suffered from a bomb cyclone (hurricanes used not to be able to get much above North Carolina on the east coast because cold water causes them to peter out; but as the Atlantic heats up further north, it opens a pathway for cyclones to come on up, which is what happened to New York with Hurricane Sandy). Any one of these events can’t be chalked up to climate change, but trends over the past 40 years can. The mean size of California chaparral fires has been increasing, as has the higher temperature range of places there (reaching 120 F. this summer). Caribbean cyclone intensity has risen significantly in just the past 20 years. In the past 35 years flood disasters have more than doubled in Europe. US cable television news, which has big positions in fossil fuels stocks, reports on these calamities only episodically and desperately avoids linking them to carbon farting. Elon Musk’s mega-battery in Australia earned its owner $800,000 over two days recently and is successfully smoothing out power generation, stepping in when coal plants go out. That is something gas turbines used to do, and they are no longer needed. In fact, neither is the coal any longer needed if you can combine solar and wind with mega-batteries. Which is the next step. For people who have to drive and aren’t in the Tesla 3 queue, the Chevy Bolt (the best-selling electric vehicle in the US) is an attractive option at the moment, and it is only the beginning of the Chevy electric fleet. Combine it with rooftop solar panels and you’ll pay off both in 7 years after which fuel for house and car is free. A challenging amount of global heating will be difficult. You will like severe even less. The third level and possibility is catastrophic, which speaks for itself. It all depends on how much we fart.